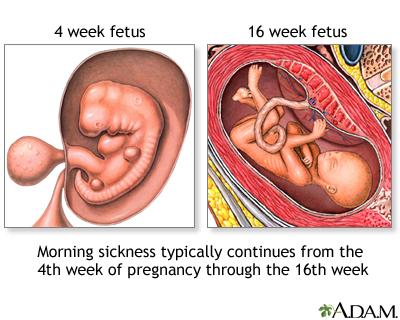 Morning sickness usually begins during the first month of pregnancy and continues until the 14th to 16th week. Although, some women can have nausea and vomiting through their entire pregnancy. Morning sickness is very common and does not hurt the baby in any way. The exact cause of morning sickness is unknown. However, it may be caused by either hormonal changes or lower blood sugar during early pregnancy. Emotional stress, traveling, or some foods can aggravate the problem.